This is the homepage when accessing fleio from the end-user panel. Images: Manage your created images (snapshots). Billing History: The cost for each instance, image, volume or for all. Invoicing: View all your invoices. Instances: Manage your instances. View details for your instances. Floating IPs: Manage your floating IPs. SSH Keys: Manage your SSH keys. My images: Manage your created images (snapshots). Available Credit: Your available credit. 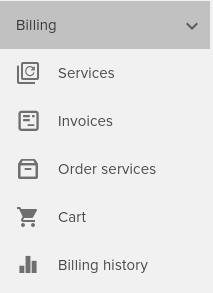 Click ``Add new credit`` to specify the amount then choose the method of payment on the invoice page. Usage: The cost for each instance, image or volume. Account summary: The summary of your total instances, total images, total volumes and total SSH keys. Notifications: Here you receive all kind of notifications from our system. My Profile: Change your name, last name, email address, password, theme. Log Out: Log-out from your account.